AVQuest launches Cloud Based Hospitality Analytics product for Competitor and Guest Data - "Analytics by AVQuest"
Revenue Managers can finally say goodbye to painstaking manual tasks and guesswork for deciding rate changes based on competitor rates, availability, demand, events, customer history and reputation. Key business decisions can now be made in just a few clicks – saving time, resources, increasing productivity and revenue. “Developed alongside our customers and addressing Revenue Manager’s burdens, we are excited to release our new Analytics product. This offers our customer a set of intuitive, easy-to-use tools to effortlessly increase revenue, improve online reputation and drive towards better customer experiences. We have been continuously working on helping clients streamline and improve efficiency to increase cash flows, and we are now helping them to harness the power of Analytics by AVQuest to further improve their revenues and online reputation” says Rajpal Randhawa, CEO of AVQuest. 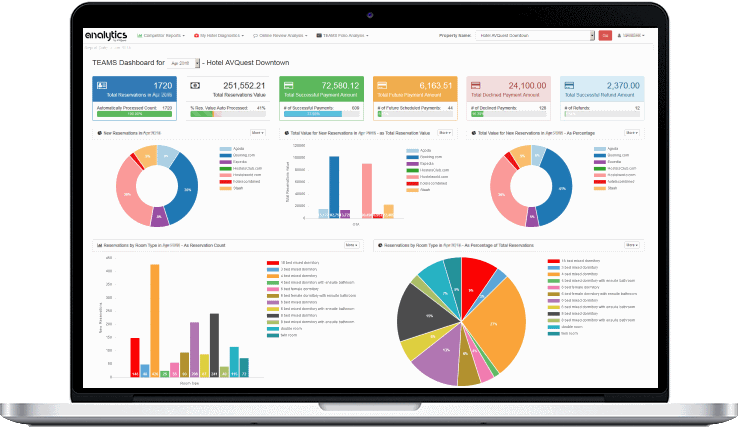 The Analytics by AVQuest suite of tools focus on various key essentials for any Revenue Manager. These include competitor availability and rates, anomalies in distribution and rates, online review analysis and guest data analysis. The suite of tools provide a detailed insight into competitor and guest data which is presented in a simple and intuitive manner, making it the “swiss army knife” for Revenue Managers of large chains and equally as effective and easy to use for smaller independent hotels. It’s commonly known that distributing availability across many OTA channels can introduce the possibility of human and system errors. The Analytics tools highlight OTA distribution issues and anomalies in a single mouse click. Helping Revenue Managers identify distribution issues quickly and efficiently which more often than not, go unnoticed or are far too laborious and time consuming to identify manually. “We believe that today’s market requires competitor analysis, online reputation analysis, and guest data analytics to be used as the basis of attracting more business. This is why we use Analytics by AVQuest to analyze this data as it brings all the sources of data available to a hotel into a single platform. This consolidation of data enables better revenues and opens up new methods to attract better rates and occupancy.” says Graham Ritchie, CTO at AVQuest. Analytics by AVQuest is now available for hotels, hostels and serviced apartment providers and is already being used by customers across Europe and South Africa.